3Young Researchers and Elite Club, Science and Research Branch, Islamic Azad University, Tehran, Iran. Drought stress is one of the most determinative factors of agriculture and plays a major role in limiting crop productivity. This limitation is going to rising through climate changes. However, plants have their own defense systems to moderate the adverse effects of climatic conditions. MicroRNA-mediated post-transcriptional gene regulation is one of these defense mechanisms. The root endophytic fungus Piriformospora indica enhances plant tolerance to environmental stress based on general and non-speciﬁc plant species mechanisms. In this work, we investigated the effects of drought and P. indica inoculation on the expression of two important miRNAs, miR159 and miR396, in rice plants. To this end, leaf samples were harvested at control (F.C.) and severe drought stress (25% F.C.) in P. indica-colonized and non-inoculated rice plants 4 weeks after fungal inoculation. We have observed contrary expression patterns of miR396 (down-regulated) and miR159 (up-regulated) under drought stress condition. However, both miRNAs showed up-regulation by P. indica inoculation. We have observed significant up-regulation of miR396 and miR159 by treatment of P. indica under drought stress condition. Regulation of growth, hyposensitivity response and bio-water saving pathways directly affected by MYB and GRF transcriptional factor. So, remarkable change of miR156 and miR396 could lead plant to be tolerable under drought stress by the fine regulation of MYB and GRF, respectively. Sherameti I., Shahollari B., Venus Y., Altschmied L., Varma A.and Oelmüller R. 2005. The endophytic fungus Piriformospora indica stimulates the expression of nitrate reductase and the starch-degrading enzyme glucan-water dikinase in tobacco and Arabidopsis roots through a homeodomain transcription factor that binds to a conserved motif in their promoters. Journal of Biological Chemistry 280: 26241-26247. Yadav V., Kumar M., Deep D.K., Kumar H., Sharma R., Tripathi T., Tuteja N., Saxena A.K.and Johri A.K. 2010. A phosphate transporter from the root endophytic fungus Piriformospora indica plays a role in phosphate transport to the host plant. Journal of Biological Chemistry 285: 26532-26544. Baltruschat H., Fodor J., Harrach B.D., Niemczyk E., Barna B., Gullner G., Janeczko A., Kogel K.H., Schäfer P.and Schwarczinger I. 2008. Salt tolerance of barley induced by the root endophyte Piriformospora indica is associated with a strong increase in antioxidants. New Phytologist 180: 501-510. Sun C., Johnson J.M., Cai D., Sherameti I., Oelmüller R.and Lou B. 2010. Piriformospora indica confers drought tolerance in Chinese cabbage leaves by stimulating antioxidant enzymes, the expression of drought-related genes and the plastid-localized CAS protein. Journal of plant physiology 167: 1009-1017. Das A., Kamal S., Shakil N.A., Sherameti I., Oelmüller R., Dua M., Tuteja N., Johri A.K.and Varma A. 2012. The root endophyte fungus Piriformospora indica leads to early flowering, higher biomass and altered secondary metabolites of the medicinal plant, Coleus forskohlii. Plant signaling & behavior 7: 103-112. Oelmüller R., Sherameti I., Tripathi S.and Varma A. 2009. Piriformospora indica, a cultivable root endophyte with multiple biotechnological applications. Symbiosis 49: 1-17. Pham G.H., Singh A., Malla R., Kumari R., Prasad R., Sachdev M., Rexer K.-H., Kost G., Luis P.and Kaldorf M., Interaction of Piriformospora indica with diverse microorganisms and plants, Plant surface microbiology, Springer, 2008, pp. 237-265. Ghabooli M., Khatabi B., Ahmadi F.S., Sepehri M., Mirzaei M., Amirkhani A., Jorrín-Novo J.V.and Salekdeh G.H. 2013. Proteomics study reveals the molecular mechanisms underlying water stress tolerance induced by Piriformospora indica in barley. Journal of proteomics 94: 289-301. Sherameti I., Tripathi S., Varma A.and Oelmüller R. 2008. The root-colonizing endophyte Pirifomospora indica confers drought tolerance in Arabidopsis by stimulating the expression of drought stress-related genes in leaves. Molecular Plant-Microbe Interactions 21: 799-807. Ghaffari M.R., Ghabooli M., Khatabi B., Hajirezaei M.R., Schweizer P.and Salekdeh G.H. 2016. Metabolic and transcriptional response of central metabolism affected by root endophytic fungus Piriformospora indica under salinity in barley. Plant molecular biology 90: 699-717. Qiang X., Weiss M., Kogel K.H.and Schafer P. 2011. Piriformospora indica—a mutualistic basidiomycete with an exceptionally large plant host range. Molecular Plant Pathology. Su Z., Ma X., Guo H., Sukiran N.L., Guo B., Assmann S.M.and Ma H. 2013. Flower development under drought stress: morphological and transcriptomic analyses reveal acute responses and long-term acclimation in Arabidopsis. The Plant Cell 25: 3785-3807. Marcińska I., Czyczyło-Mysza I., Skrzypek E., Filek M., Grzesiak S., Grzesiak M.T., Janowiak F., Hura T., Dziurka M.and Dziurka K. 2013. Impact of osmotic stress on physiological and biochemical characteristics in drought-susceptible and drought-resistant wheat genotypes. Acta physiologiae plantarum 35: 451-461. Hafez E.and Gharib H. 2016. Effect of exogenous application of ascorbic acid on physiological and biochemical characteristics of wheat under water stress. International Journal of Plant Production 10: 4. Takeuchi K., Hasegawa H., Gyohda A., Komatsu S., Okamoto T., Okada K., Terakawa T.and Koshiba T. 2016. Overexpression of RSOsPR10, a root-specific rice PR10 gene, confers tolerance against drought stress in rice and drought and salt stresses in bentgrass. Plant Cell, Tissue and Organ Culture (PCTOC) 1-12. Li Z.-F., Zhang Y.-C.and Chen Y.-Q. 2015. miRNAs and lncRNAs in reproductive development. Plant Science 238: 46-52. Omidvar V., Mohorianu I., Dalmay T.and Fellner M. 2015. Identification of miRNAs with potential roles in regulation of anther development and male-sterility in 7B-1 male-sterile tomato mutant. Bmc Genomics 16: 1. Shuai P., Liang D., Zhang Z., Yin W.and Xia X. 2013. Identification of drought-responsive and novel Populus trichocarpa microRNAs by high-throughput sequencing and their targets using degradome analysis. Bmc Genomics 14: 1. Wu M.-F., Tian Q.and Reed J.W. 2006. Arabidopsis microRNA167 controls patterns of ARF6 and ARF8 expression, and regulates both female and male reproduction. Development 133: 4211-4218. Bakhshi B., Fard E.M., Nikpay N., Ebrahimi M.A., Bihamta M.R., Mardi M.and Salekdeh G.H. 2016. MicroRNA Signatures of Drought Signaling in Rice Root. PloS one 11: e0156814. FengXi Y.and DiQiu Y. 2009. Overexpression of Arabidopsis MiR396 enhances drought tolerance in transgenic tobacco plants. Acta Botanica Yunnanica 31: 421-426. Ferdous J., Hussain S.S.and Shi B.J. 2015. Role of microRNAs in plant drought tolerance. 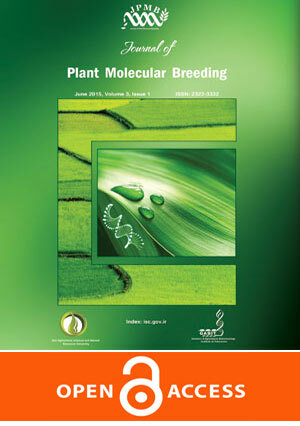 Plant biotechnology journal 13: 293-305. Jogawat A., Saha S., Bakshi M., Dayaman V., Kumar M., Dua M., Varma A., Oelmüller R., Tuteja N.and Johri A.K. 2013. Piriformospora indica rescues growth diminution of rice seedlings during high salt stress. Plant signaling & behavior 8: e26891. Jones-Rhoades M.W.and Bartel D.P. 2004. Computational identification of plant microRNAs and their targets, including a stress-induced miRNA. Molecular cell 14: 787-799. Trindade I., Capitão C., Dalmay T., Fevereiro M.P.and Dos Santos D.M. 2010. miR398 and miR408 are up-regulated in response to water deficit in Medicago truncatula. Planta 231: 705-716. Ehya F., Monavarfeshani A., Fard E.M., Farsad L.K., Nekouei M.K., Mardi M.and Salekdeh G.H. 2013. Phytoplasma-responsive microRNAs modulate hormonal, nutritional, and stress signalling pathways in Mexican lime trees. PLoS ONE 8: e66372. Baldrich P., Campo S., Wu M.-T., Liu T.-T., Hsing Y.-I.C.and Segundo B.S. 2015. MicroRNA-mediated regulation of gene expression in the response of rice plants to fungal elicitors. RNA biology 12: 847-863. Zhou L., Liu Y., Liu Z., Kong D., Duan M.and Luo L. 2010. Genome-wide identification and analysis of drought-responsive microRNAs in Oryza sativa. Journal of experimental botany 61: 4157-4168. Liu Q., Zhang Y.-C., Wang C.-Y., Luo Y.-C., Huang Q.-J., Chen S.-Y., Zhou H., Qu L.-H.and Chen Y.-Q. 2009. Expression analysis of phytohormone regulated microRNAs in rice, implying their regulation roles in plant hormone signaling. FEBS letters 583: 723-728. Ru P., Xu L., Ma H.and Huang H. 2006. Plant fertility defects induced by the enhanced expression of microRNA167. Cell research 16: 457-465. Mutum R.D., Kumar S., Balyan S., Kansal S., Mathur S.and Raghuvanshi S. 2016. Identification of novel miRNAs from drought tolerant rice variety Nagina 22. Scientific Reports 6. Cheah B.H., Nadarajah K., Divate M.D.and Wickneswari R. 2015. Identification of four functionally important microRNA families with contrasting differential expression profiles between drought-tolerant and susceptible rice leaf at vegetative stage. Bmc Genomics 16: 692. Arenas-Huertero C., Pérez B., Rabanal F., Blanco-Melo D., De la Rosa C., Estrada-Navarrete G., Sanchez F., Covarrubias A.A.and Reyes J.L. 2009. Conserved and novel miRNAs in the legume Phaseolus vulgaris in response to stress. Plant molecular biology 70: 385-401. Liu H.-H., Tian X., Li Y.-J., Wu C.-A.and Zheng C.-C. 2008. Microarray-based analysis of stress-regulated microRNAs in Arabidopsis thaliana. Rna 14: 836-843. Zhou X., Wang G., Sutoh K., Zhu J.-K.and Zhang W. 2008. Identification of cold-inducible microRNAs in plants by transcriptome analysis. Biochimica et Biophysica Acta (BBA)-Gene Regulatory Mechanisms 1779: 780-788. Zhang Z., Wei L., Zou X., Tao Y., Liu Z.and Zheng Y. 2008. Submergence-responsive microRNAs are potentially involved in the regulation of morphological and metabolic adaptations in maize root cells. Annals of botany 102: 509-519. Allen R.S., Li J., Alonso-Peral M.M., White R.G., Gubler F.and Millar A.A. 2010. MicroR159 regulation of most conserved targets in Arabidopsis has negligible phenotypic effects. Silence 1: 1. Reyes J.L.and Chua N.H. 2007. ABA induction of miR159 controls transcript levels of two MYB factors during Arabidopsis seed germination. The Plant Journal 49: 592-606. Wang L., Gu X., Xu D., Wang W., Wang H., Zeng M., Chang Z., Huang H.and Cui X. 2011. miR396-targeted AtGRF transcription factors are required for coordination of cell division and differentiation during leaf development in Arabidopsis. Journal of experimental Botany 62: 761-773. Huong P.G., Kumari R., Singh A., Malla R., Prasad R., Sachdev M., Kaldorf M., Buscot F., Oelmüller R.and Hampp R. 2004. Axenic culture of symbiotic fungus Piriformospora indica. Plant surface microbiology 593-613. Xue X., Sun J., Zhang Q., Wang Z., Huang Y.and Pan W. 2008. Identification and characterization of novel microRNAs from Schistosoma japonicum. PloS one 3: e4034. Chen C., Ridzon D.A., Broomer A.J., Zhou Z., Lee D.H., Nguyen J.T., Barbisin M., Xu N.L., Mahuvakar V.R.and Andersen M.R. 2005. Real-time quantification of microRNAs by stem–loop RT–PCR. Nucleic acids research 33: e179-e179. Jain M., Nijhawan A., Tyagi A.K.and Khurana J.P. 2006. Validation of housekeeping genes as internal control for studying gene expression in rice by quantitative real-time PCR. Biochemical and biophysical research communications 345: 646-651. Varkonyi-Gasic E., Wu R., Wood M., Walton E.F.and Hellens R.P. 2007. Protocol: a highly sensitive RT-PCR method for detection and quantification of microRNAs. Plant methods 3: 1. Das J., Ramesh K., Maithri U., Mutangana D.and Suresh C. 2014. Response of aerobic rice to Piriformospora indica. Alonso-Peral M.M., Li J., Li Y., Allen R.S., Schnippenkoetter W., Ohms S., White R.G.and Millar A.A. 2010. The microRNA159-regulated GAMYB-like genes inhibit growth and promote programmed cell death in Arabidopsis. Plant Physiology 154: 757-771. Mirzaei M., Soltani N., Sarhadi E., George I.S., Neilson K.A., Pascovici D., Shahbazian S., Haynes P.A., Atwell B.J.and Salekdeh G.H. 2013. Manipulating root water supply elicits major shifts in the shoot proteome. Journal of proteome research 13: 517-526. Mirzaei M., Soltani N., Sarhadi E., Pascovici D., Keighley T., Salekdeh G.H., Haynes P.A.and Atwell B.J. 2011. Shotgun proteomic analysis of long-distance drought signaling in rice roots. Journal of proteome research 11: 348-358. Kim J.H., Choi D.and Kende H. 2003. The AtGRF family of putative transcription factors is involved in leaf and cotyledon growth in Arabidopsis. The Plant Journal 36: 94-104. Kim J.H.and Kende H. 2004. A transcriptional coactivator, AtGIF1, is involved in regulating leaf growth and morphology in Arabidopsis. Proceedings of the National Academy of Sciences of the United States of America 101: 13374-13379. Liu D., Song Y., Chen Z.and Yu D. 2009. Ectopic expression of miR396 suppresses GRF target gene expression and alters leaf growth in Arabidopsis. Physiologia plantarum 136: 223-236. [Wang Y., Chen X.and Xiang C.B. 2007. Stomatal Density and Biowater Saving. Journal of Integrative Plant Biology 49: 1435-1444.